Meal Prep like a Pro with these best Meal Prep ideas & tips to ensure you stay on track with your muscle building goals. It is easy to say ‘I don’t have the time’ and make excuses about why you’re not hitting your goals but did you know meal prep can actually save you time in the kitchen! Plan for the week ahead with these best Meal Prep Ideas to ensure you stay on track with your muscle building goals. Whether your goal is to build muscle size or get lean the principle behind meal prep is the same, the difference is the balance of macronutrients you choose to put into each meal. You can meal prep and plan meals in advance for just lunches, lunch and dinner, or all three meals of the day and snacks too if you’re super organised. Here are our top meal prep ideas and tips. 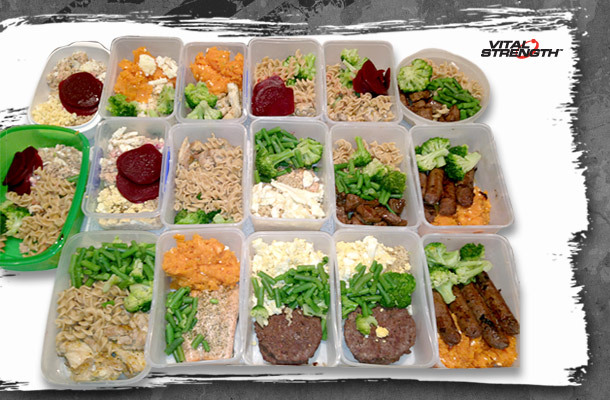 Meal Prep Ideas & Tips #1: Containers and portion sizes. Before beginning your meal prep get yourself a number of plastic or glass containers, of varying sizes that can go in both the microwave and freezer. Make sure you buy good quality containers that won’t crack after a couple of uses. Set the containers out on the bench ready for your meal prep. Purchase a food scale so that you can measure out the weight of your muscle meals and get the correct portion sizes. Electronic scales tend to be the most accurate for meal prepping and are easy to use. Also get a set of measuring cups to improve the accuracy of your meal prep portion sizes. The whole idea behind meal preparation is to save time by cooking in bulk. This means cooking enough food to keep you going for the week ahead. To make it easier you may want to set up the barbeque to cook all your chicken, use a rice cooker for your carbs or even invest in a slow cooker or crock pot. Whatever you choose you are going to need a bit of space to set up your assembly line! Keep it simple by using this meal prep guideline, while also making sure you add in some healthy fats to your meal prep too. How much of each of these you need will depend on your goals and caloric requirements. For more on macronutrient ratios click here. Meal Prep Tip: Make foods that keep. Chicken Breast and Mince are good for meal preps and fish is good too but needs to be eaten in the first day or two. Along with plastic containers for each meal, all serious bodybuilders will also have their shakes planned for the day too. If your goal is to gain muscle size try Vitalstrength Pro-Muscle or if you want to get lean and ripped choose Vitalstrength Ripped Protein. Meal Prep is an essential part of your muscle building program. The key to sticking to your plan is to know what you’re eating for the week ahead and stick to it. So now it’s time to start cooking! Want more articles like this? Sign up for our monthly newsletter and get free training, meal and nutrition tips.